There is no question that having reliable welding equipment in Mississauga is good for business. Malfunctioning or broken equipment will drain your resources; either by being unavailable for use or by requiring more time or expertise to obtain a suitable finished product. But, does your welding equipment need to be in bad shape in order to reap the benefits of new equipment? Not necessarily. Why Replace Older Welding Equipment? While the old adage, “If it ain’t broke, don’t fix it” is a sound business principle, there are times when replacing functional equipment with newer products makes sense. Well-maintained welding equipment can last for years before it absolutely needs replacement, but new equipment brings many benefits that your old equipment doesn’t have. New welding equipment in Mississauga is typically cleaner, faster, and more efficient than older equipment, even older equipment that is running perfectly. Today’s welding equipment can reduce prep time, reduce weld defects, reduce the amount of training that is needed by the welders themselves, and increase deposition rates. That’s in addition to their increased power efficiencies, which can justify the cost of new equipment all by itself. Your existing equipment doesn’t have to be ancient to reap these benefits. Even equipment that is 10 years old can be costing you money in several ways, either through power demands or weld inefficiencies. Whether you work with only certain metals or with several different types of metals, you know that the right equipment makes all the difference in a job done right. Certain pieces or even brands of welding equipment work best with certain materials. When components work well together everything proceeds more smoothly. Not only will the welds be easier to perform, improving efficiency, but they will also be of better quality. Welding of aluminum, for example, can be challenging due to the metal’s thermal expansion and high thermal conductivity. But, with the right equipment, equipment that has been specifically designed to work with the challenges that aluminum presents, the job can be made easier and the results more consistent. Matching your new equipment to the materials you work with is something the team at Josef Gas can help you with. We are your one-stop for all welding equipment in Mississauga. You can count on us to source equipment from all the major brands, provide accessories and welding gases, and offers hands-on support and advice to outfit your new operations. If you think new equipment sounds great, but can’t see it happening based on current budget numbers, consider a rolling replacement program. There’s no need to do a full out replacement on everything all at once. Start our by replacing just one or two pieces, then, over time, swap out more pieces as your budget allows. We’re certain that once you start using the new equipment and benefitting from the improved efficiencies, you’ll notice a quick ROI and replacement will make more sense both financially and operationally. To get started, call Josef Gas at 416.658.1212. We can help you identify needs, source equipment and price out your equipment options, and develop a short or long-term replacement plan that works with your budget. We even offer financing to help ease the strain that major equipment purchases can place on a business. 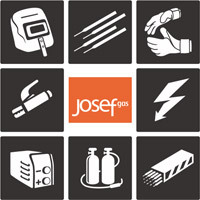 Contact Josef Gas online at info@josefgases.com to discuss replacing your old welding equipment in Mississauga today!